myCoco Coconut Coir (Expanded RTU) 50L 55/plt | Cinnabar Valley Farms Ltd.
myCoco Coconut Coir is made from ground coconuts originating in south east Asia. Cinnabar is the importer of the compressed coconut fiber and we then expand the dried coconut product to produce a "Ready to Use" growing media. Coconut fiber is 100% renewable and due to its fine structure and texture it provides excellent conditions for root growth. 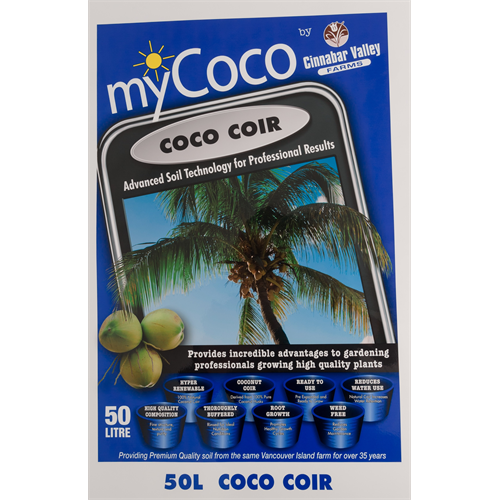 Our coconut products have been thoroughly rinsed to provide optimal pH and they are free of weeds.